Sweet superstar Fortune Feimster (The Mindy Project, Champions), joins Dave and Matt this week to talk all about her recent engagement, going to “gay grad school”, and rubbing arms with straight girls. Plus, Dave gushes about HQ trivia, Matt breaks down “Riverdale”, and everyone learns about putting their phones “on discreet”. 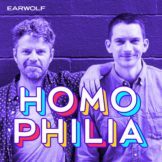 This episode is sponsored by Tripping.com and Sony Pictures Classics’ Call Me By Your Name.